Maria Maddalena de Pazzi (baptized Caterina) is a sixteenth century (Born 2 April, 1566; died 25 May, 1607) Italian virgin Carmelite mystic (Mysticism, which comes from the Greek root Mystikos, “connected with the mysteries,” is a desire or tendency of the soul toward intimate connection with God. 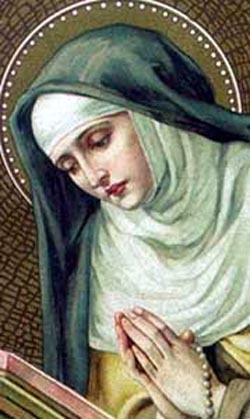 The ultimate aim of a mystic is to become completely united with Divinity) and saint, who led a life of intense prayer and self-denial, praying ardently for the renewal of the Church and encouraging her sisters in holiness. Her life, devoted in a deep and personal way to Christ in the Eucharist, was marked by many extraordinary graces. The Church of San Frediano in Cestello, Florence, Italy, is the site of the former cloistered Carmelite convent of Santa Maria degli Angeli, where St. Magdalen professed her vows and lived a life devoted to Christ.